Once the Raspbian image is written on the SD disk, it can be inserted into the Raspberry PI SD port. Just connect the power supply and Raspberry PI will boot for the first time. 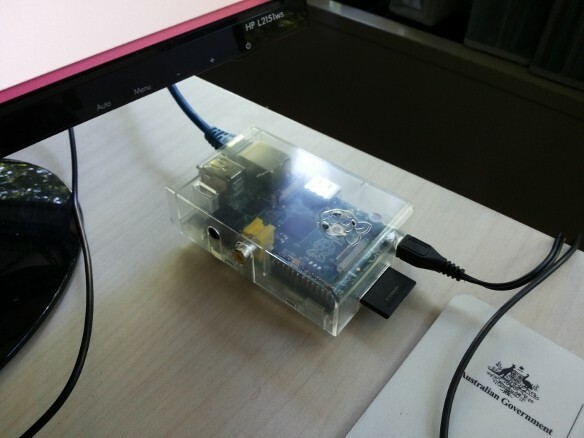 On the HDMI display, login and password will be required: the Raspbian image has already defined an user named “pi” (having password “raspberry”) with root privileges. A step by step configuration tool will be shown for the first time (where you can set minimal configurations like machine name, etc.). Following boots will require login and password only. Raspberry PI can support many Linux versions optimised for the ARM processor that’s built into the motherboard. Many of those versions are derived from the most popular PC versions – for example “Pidora” from Fedora, or “Raspbian” from Debian. The project website contains a list of available Linux versions for Raspberry PI.